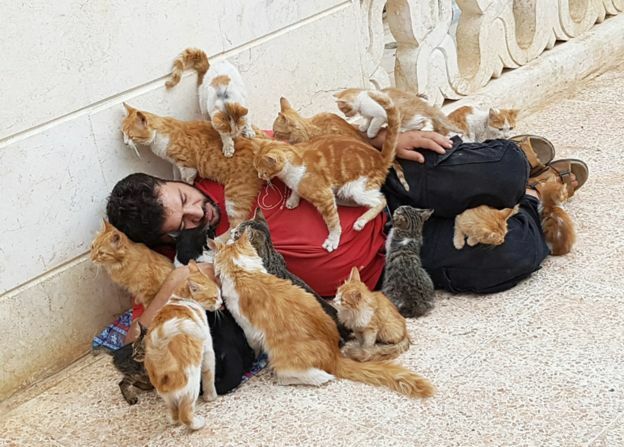 The cat man of Aleppo, Mohammad Aljaleel, touched the hearts of millions when his sanctuary featured in a BBC video in 2016 (above). He had to leave the city when it fell to Syrian government forces, but he's now back - in an area nearby - and helping children as well as animals, reports Diana Darke. 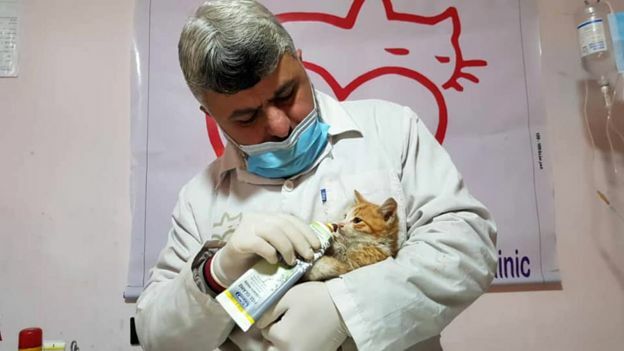 Just weeks after the video was filmed, Mohammad Aljaleel (known to everyone as Alaa) watched helplessly as his cat sanctuary was first bombed, then chlorine-gassed, during the intense final stages of the siege of Aleppo. Most of his 180 cats were lost or killed. 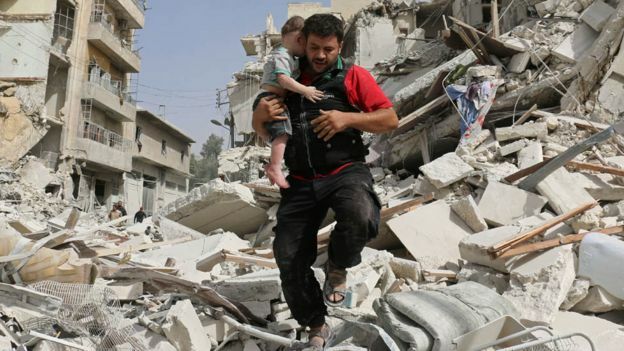 Like thousands of other civilians he was trapped in the eastern half of the city under continuous bombardment from Russian and Syrian fighter jets. As the siege tightened, he was forced from one Aleppo district to another, witnessing unimaginable scenes of devastation. Yet throughout, he continued to look after the few surviving cats and to rescue people injured in the bombing, driving them to underground hospitals. 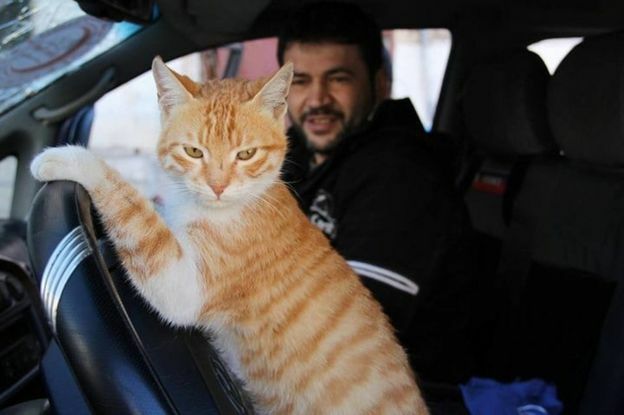 When the city fell in December 2016, he left in a convoy, his van crammed full of injured people and the last six cats from the sanctuary. "I've always felt it's my duty and my pleasure to help people and animals whenever they need help," Alaa says. "I believe that whoever does this will be the happiest person in the world, besides being lucky in his life." 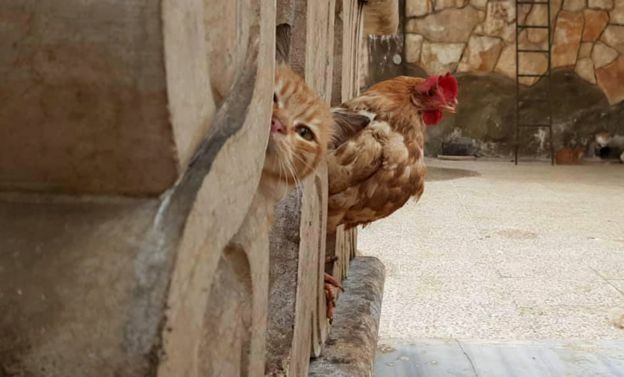 After a brief recuperation in Turkey, he smuggled himself back into Syria - bringing a Turkish cat with him for company - and established a new cat sanctuary, bigger and better than the first one, in Kafr Naha, a village in opposition-held countryside west of Aleppo. 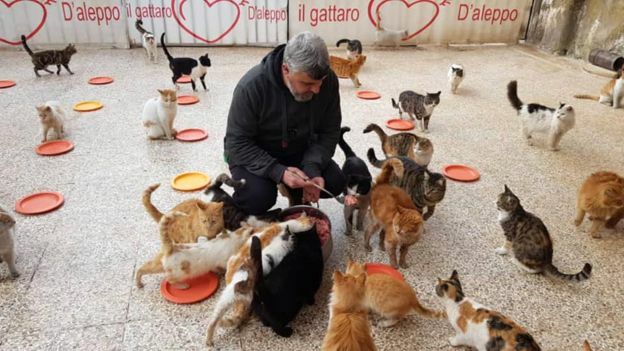 Using the same crowdfunding model employed successfully in east Aleppo, funds were sent in by cat-lovers from all over the world via Facebook and Twitter. But Alaa has always worked for the benefit of the community, as well as the cats themselves. 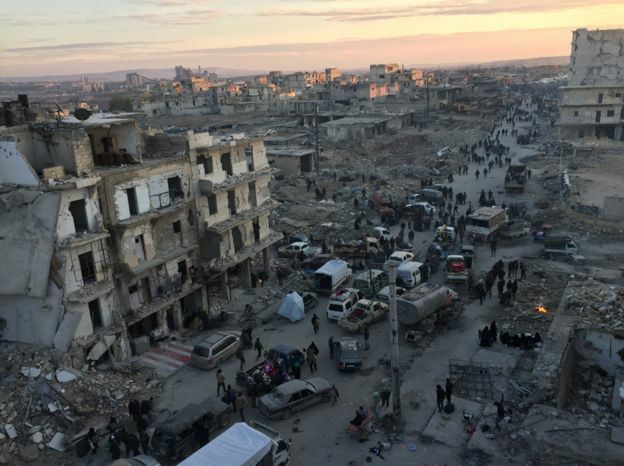 In Aleppo, he and his team of helpers bought generators, dug wells and stockpiled food. Even at the height of the bombing, they ran animal welfare courses for children, to develop their empathy. They also set up a playground next to the sanctuary where children could briefly escape from the apocalyptic events taking place all around them. The new sanctuary has expanded to include an orphanage, a kindergarten and a veterinary clinic. Alaa and his team resemble a small development agency, providing services that government and international charities cannot or will not. 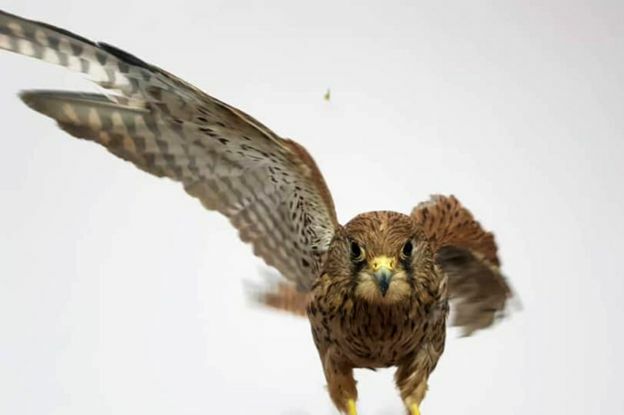 He strongly believes that helping children to look after vulnerable animals teaches them the importance of kindness to all living creatures, and helps to heal their own war traumas. "Children and animals are the big losers in the Syrian war," he says. "It's the adults who so often behave badly." 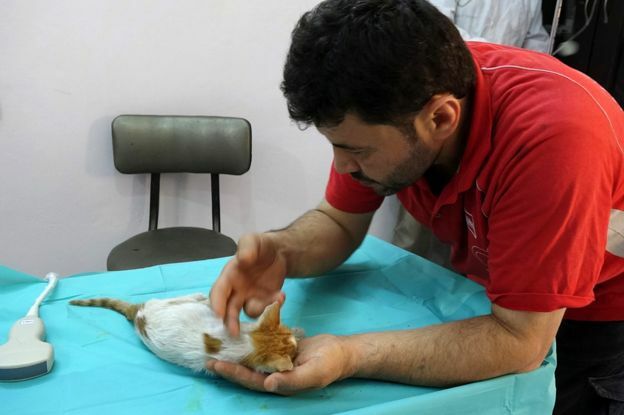 As a boy growing up in Aleppo, Alaa had always looked after cats, spurring his friends to do likewise, even though keeping cats and dogs as pets is not customary in Syria or the rest of the Arab world. He started working aged 13, as an electrician, but also turned his hand to many other jobs - painter, decorator, IT expert, satellite-dish installer… he even traded toys between Lebanon and Syria. He worked hard and he learned how to get things done. "May the dust turn to gold in your hands, Alaa," his mother used to say. His dream was to become a fireman like his father and work in search and rescue, but such jobs were handed out only to those with connections, and the connection through his father was not enough. So for years his applications were rejected. "Of course I would never have wished for a war in order to make my dream come true. I wish I could have achieved these things without the suffering I have seen," he says. "God blessed me by putting me in a position where I could help people by being a rescue man, but in my worst nightmares I never imagined a war like this for my people or for my country, or even for a single animal." During the siege in Aleppo he used to visit both Christian and Muslim old people's homes, distributing food. Extremist groups such as al-Qaeda-affiliated Jabhat al-Nusra regularly chided him, calling him a kaafir, an unbeliever, but he continued regardless. "Our Prophet Muhammad was good to everybody. He spoke with all Christians and Jews. I believe in Moses, Jesus and Muhammad, because all of them had a noble aim. I'm a Muslim, but I am not a fanatic. I just take from religion everything that's good and that I can learn things from," Alaa says. Despite the difficulties he has endured, Alaa has always maintained a wicked sense of humour. At the new sanctuary, a tabby called Maxi the Marketing King is chief fundraiser, soliciting "green kisses" in the form of dollar bills via social media accounts. 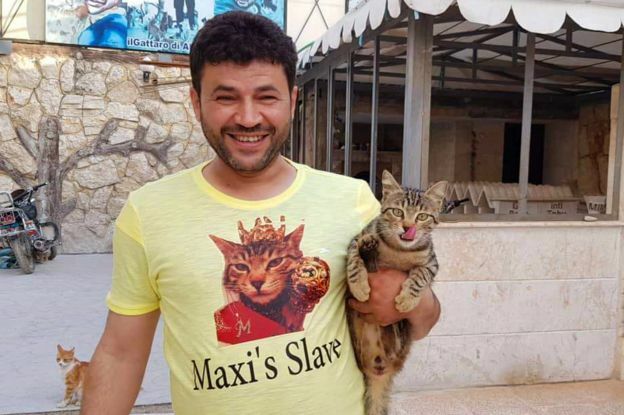 Alaa wears a T-shirt with "Maxi's Slave" written on it, and gets ticked off for smoking too much or for not cooking gourmet meals. He admits his shortcomings. "We submit to Maxi's authority as the ruler of his kingdom. But even with Maxi's leadership it wasn't easy to launch the new sanctuary," he says. This is an understatement. The rebel-held area where Alaa now lives is semi-lawless and when powerful gangs realised he was receiving funds for the sanctuary, they attempted to kidnap him. He was no longer being bombed, but his life was still at risk. As well as cats, the new sanctuary has dogs, monkeys, rabbits, a chicken that thinks it's a cat, and an Arabian thoroughbred horse. "There are so few thoroughbred horses left inside Syria now that I worry about finding him a mare to breed with. I plan to perform the role of a traditional Syrian mother and try to find him a wife, so that he can have children and start building up the population of thoroughbred horses in Syria again," Alaa says. All the animals have names, generally awarded by Alaa. An aggressive black-and-white cat who came to the sanctuary, stole food and terrified all the other cats was nicknamed al-Baghdadi, after the Iraqi leader of Islamic State (IS). 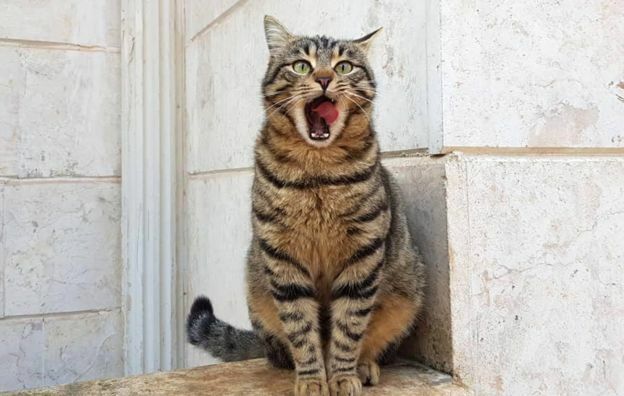 "Of course, this cat was a million times better than that evil murderer al-Baghdadi, but this name came to mind because his presence in the sanctuary coincided with the arrival of IS gangs in Aleppo," Alaa says. A large ginger tomcat was given a Trump hairstyle and christened The Orange President of the Sanctuary. A pair of speedy acrobatic cats were called Sukhoi 25 and Sukhoi 26, after Russian fighter jets. "They're old planes, but effective enough for the job required of them in Syria. We always knew when the Russians were coming to bomb us because of their very loud engine noise. We'd shout: 'Watch out! A Sukhoi is coming!'" Alaa's reputation inside Syria has travelled far and wide, and the government is well aware of his activities. 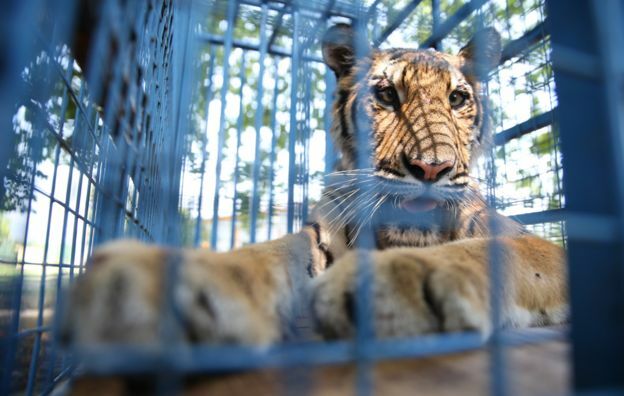 In 2017 he was called by the Magic World Zoo, south of Aleppo, which asked desperately for his help to feed the neglected lions, tigers and bears - which he did, despite the dangers of the journey which involved passing through Jabhat al-Nusra checkpoints. While there, he discovered he had been recommended by the Syrian Ministry of Agriculture. "It was funny that the ministry knew about us and was handing over responsibility for the zoo animals to us," he says. "The Magic World Zoo gave me a lot of headaches." 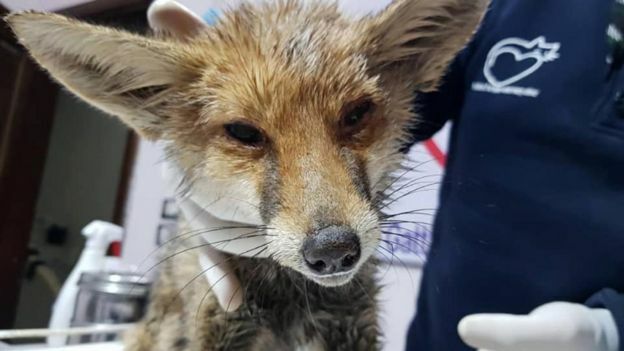 Alaa was eventually able to negotiate a solution for the animals with a charity called Four Paws, which arranged for the animals that hadn't died to be transported out of Syria to new homes in Belgium, the Netherlands and Jordan. In the new sanctuary he looks after 105 children, of whom 85 are "orphans" (in Syria the word covers children who have lost a breadwinner, as well as those who have lost both parents). Only 11 children actually sleep in the orphanage at present, because it isn't finished, but all receive education, food and clothes, for which Alaa pays 25 euros per month. The biggest risk is the instability in the region. 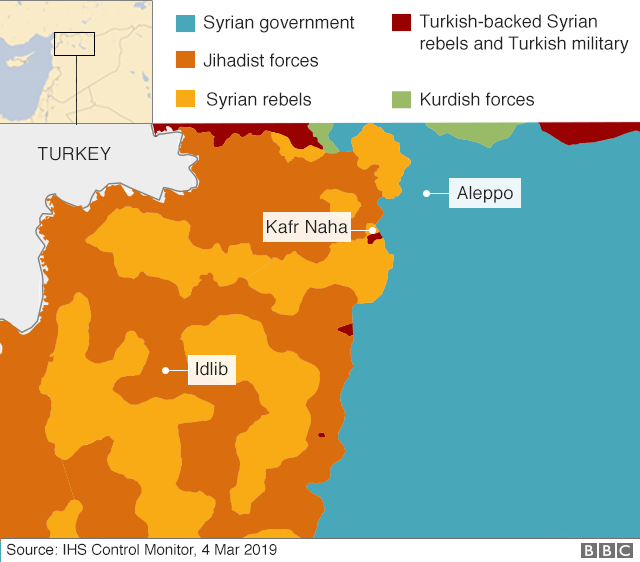 Clashes break out periodically, as it's close to the border with Idlib province, which is controlled by rebel groups who often fight each other. No-one knows what will happen next to that part of Syria and who will end up in charge. "I blame all fighting parties equally - no matter who they are or why they say they're fighting - for the killing of civilians," Alaa says. 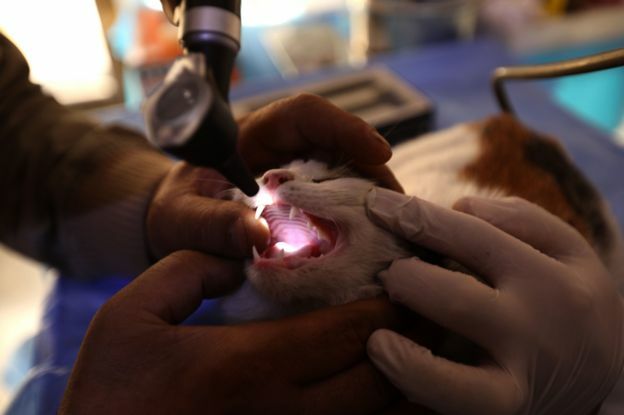 "We are rebuilding our communities and my role in that is to rebuild my sanctuary for cats. Friendship between animals is a great thing and we should learn from them. I'll stay with them no matter what happens. "It seems the world cannot solve wars and conflicts these days. That's why there are now so many refugees around the world, but especially here in the Middle East. "I do not want to be a refugee. I want to stay in my country, in Syria. I want to help people in any way I can." Diana Darke is the author, with Alaa Aljaleel, of The Last Sanctuary in Aleppo.